I’ve been back at work a week after the holidays and I had a lot of good intentions, but I also have a lot of Christmas leftovers. I hate food waste and really struggle to throw anything away, which is probably why I need to go on a bit of a diet! This clementine & mincemeat drizzle cake is the definition of my struggles, it used up the mincemeat I had leftover and some very tired looking clementines that were sat in the fruit bowl. but it meant I had cake to eat! 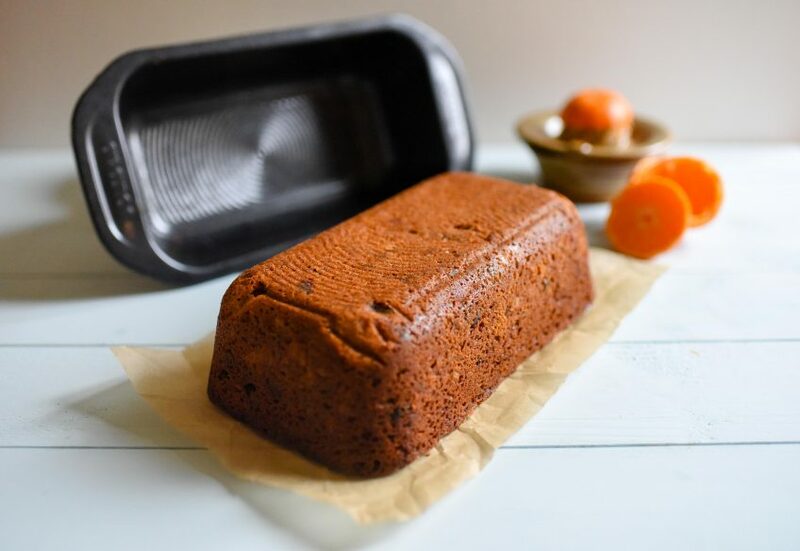 Another reason for making this clementine & mincemeat drizzle cake, is that I was sent some fantastic Circulon Ultimum bakeware, including a great 2lb loaf tin that was just perfect for this cake. 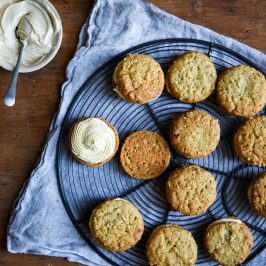 The tins are really great, they’re sturdy, non-stick and they don’t warp when you bake with them. As I mentioned, the inspiration behind this cake is to use up leftovers, the candied clementines were something I’ve wanted to make for a while and they make this cake look really special. The best thing about the candied clementines is that they are so easy to make, you just boil slices of clementines in the sugar syrup and dry them slowly in the oven. 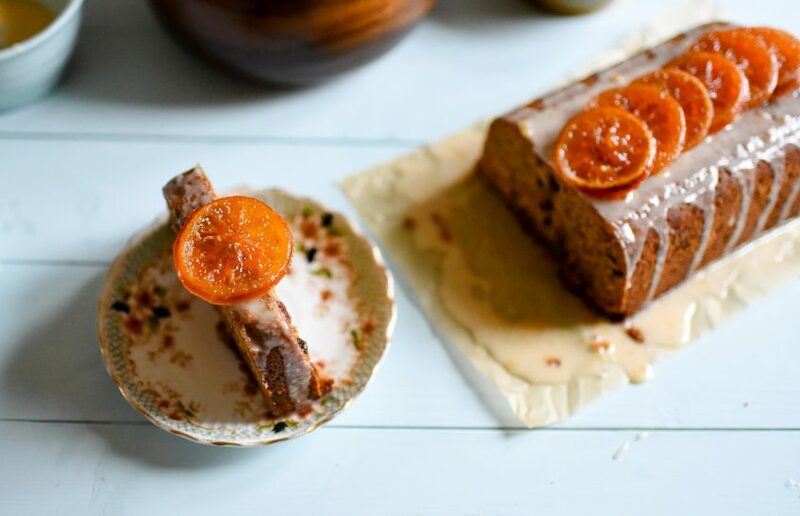 Here’s the recipe for the clementine & mincemeat drizzle cake, it’s a lovely easy bake, which is just what you need after the epic cooking of Christmas day and all of the other doubtless, bouts of time you’ve spent in the kitchen over the last few weeks preparing food and drink for guests. If you want to make this cake and you don’t have any leftover mincemeat, you can use the recipe I have here to make your own, or buy a cut price jar that will probably be on sale throughout the whole of January! 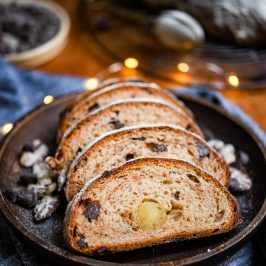 This is a great recipe to use up leftover mincemeat and any clementines you might have in the fruit bowl that look a bit tired. 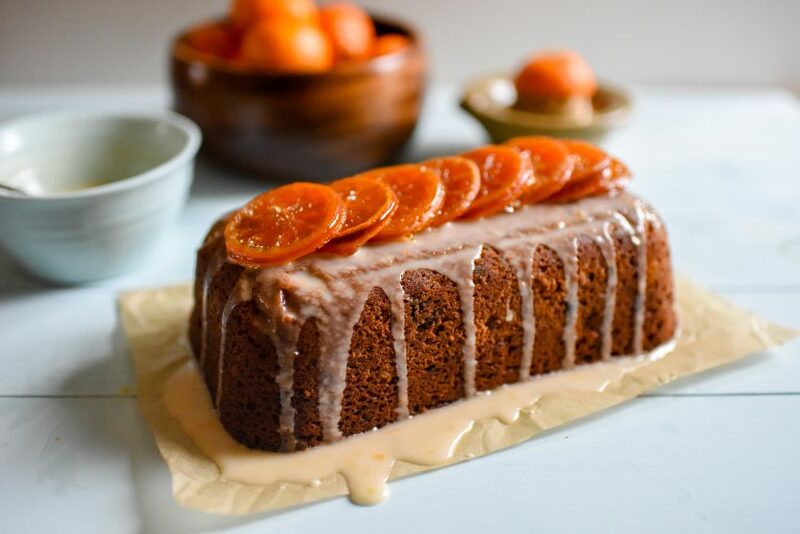 The candied clementines make this cake look really special and they taste delicious. Preheat the oven to 160C/fan 140C/gas 3. Grease a 900g loaf tin and line the base with baking parchment. Place the butter and sugar in the bowl of a stand mixer with the paddle attachment fitted. Cream the two together until light and fluffy. Slowly add the eggs and scrape down the sides of the bowl with a spatula, ensuring everything is mixed together evenly. Take the mincemeat, mixed peel and clementine zest and juice and mix together. Stir this into the butter, egg mixture and beat until combined. Finally sift in the flour and baking powder and mix until everything is fully mixed together. Turn into the prepared loaf tin and level out evenly. 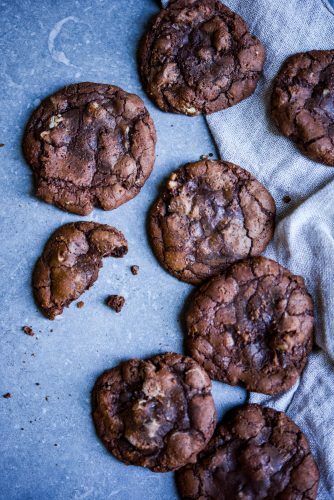 Bake in the preheated oven for about 1 hour 15 minutes or until the cakes are golden brown, firm to the touch and a skewer inserted into the centre comes out clean. 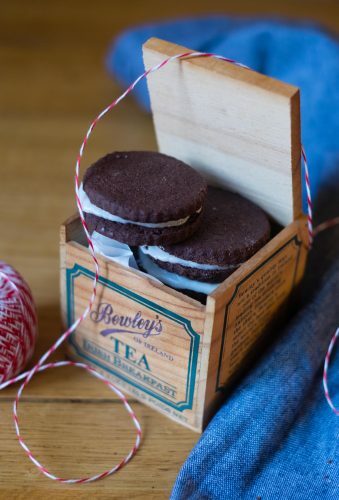 Allow the cakes to cool in the tins for a few minutes, then loosen the sides with a small palette knife, turn out on to a wire rack and leave to cool. While the cake is cooking, make the candied clementines, put the sugar and water in a saucepan and bring to the boil. Add the clementine slices, then reduce the heat to a gentle simmer. Cook until the fruit looks translucent – about 2 hours. 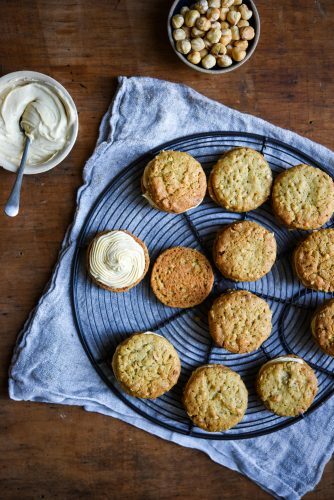 Pre-heat the oven to 100C/80C Fan, and carefully lift the slices from the syrup and place on a baking tray lined with baking parchment or a silicone baking mat. Bake for about 45-60 minutes or until they’re a little less wet (just slightly tacky). Set aside until cool. To make the icing, sift the icing sugar into a bowl and add the juice from one of the clementines, mix and then slowly add the remaining clementine juice until the glaze is thick but pourable, you probably wont need all of the juice. Turn the cake upside down so the bottom is now the top, and drizzle with icing and decorate with candied clementines. 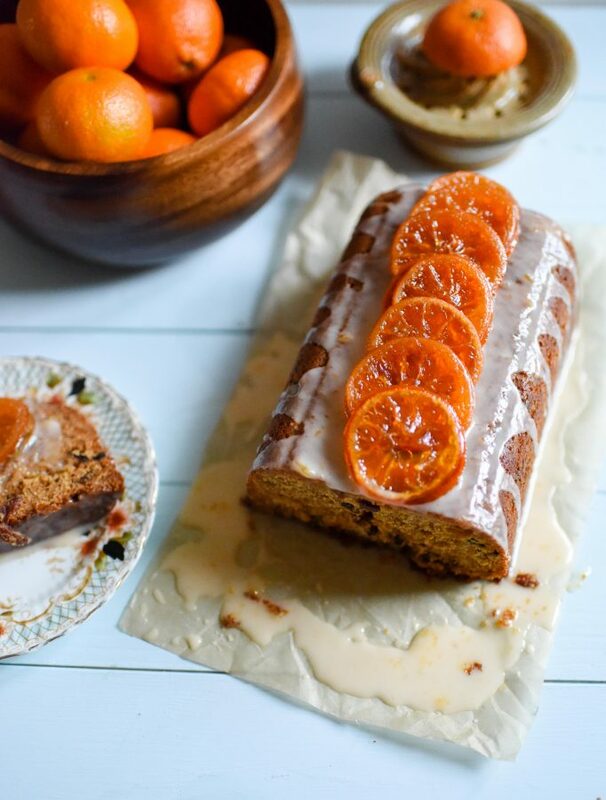 Circulon have a 20% off January sale on selected items so you can have some of own Circulon Ultimum bakeware and maybe even make this clementine & mincemeat drizzle cake. This post was sponsored by Circulon, but all opinions are my own. I’ve added this to the No Waste Food Challenge. This looks absolutely and utterly delicious! 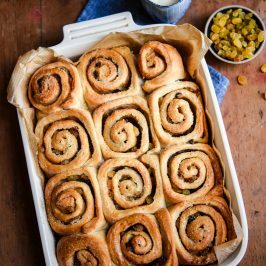 What a great way to use up tired clementines and leftover mincemeat! Thank you for sharing with the No Waste Food Challenge! Thanks Elizabeth, this is a really tasty cake. I absolutely hate food waste, so this is the perfect cake! This looks so moist and delicious. YUM! It’s really good Kimberly, it tastes wonderful. I don’t believe I have ever had a clementine before but they look delicious, especially when candied. Are they simillar to an orangee? Will have to try this with my left over mincemeat. They are very similar to an orange, but less pith and they are sweeter and juicer. They are really tasty, you’ll love them, they’re very popular around Christmas time. That is just stunning Angela, so so beautiful. i just love the colour of those candied clementines, and the loaf tin looks so sturdy. Thank you so much Helen, the candied clementines are so easy, but they make it look really special. The loaf tin is great, I’m seriously impressed. I hate waste too! 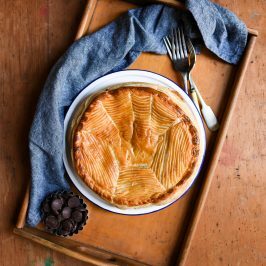 It’s good to see some recipes using up those Xmas left overs 🙂 This looks gorgeous, off to check out those tins now! Sus the tins are great, be sure to use the code 🙂 I am so glad I’m not the only one that hates food waste! It feels like throwing away money! 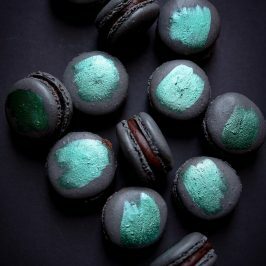 This cake sounds delicious and is absolutely gorgeous! I love the clementines on top – so pretty! Thank you so much Kristine, I’m so glad you like this, it’s really easy to make the clementines and they taste great dipped in chocolate. Oh my!! this sure looks super good and oh so perfect!! LOVE the clemetines here. 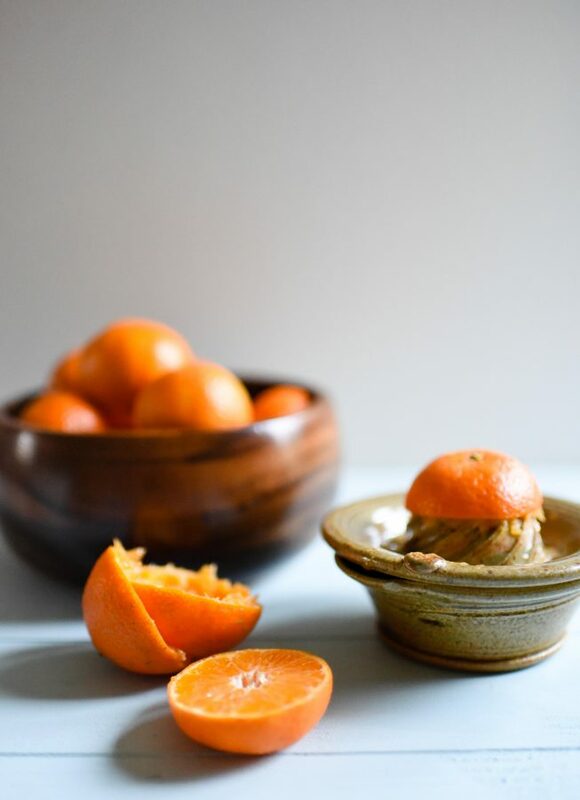 These clementines are so good, they’re really easy to make, but they make it look so pretty. This recipe is excellent for using those Christmas left overs. I bet the clementines are gorgeous on the top. Useful tin too! The tin is great Bintu, I can’t wait to make bread in it. The clementines on top are so delicious, if you try them you’ll love it. 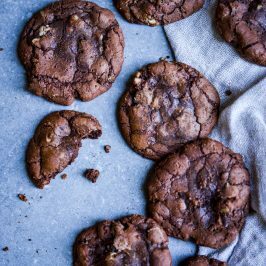 What a great way of using up leftover mincemeat! 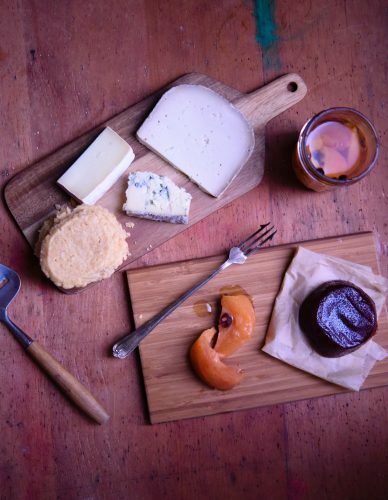 I do love those clementine slices on the top too! 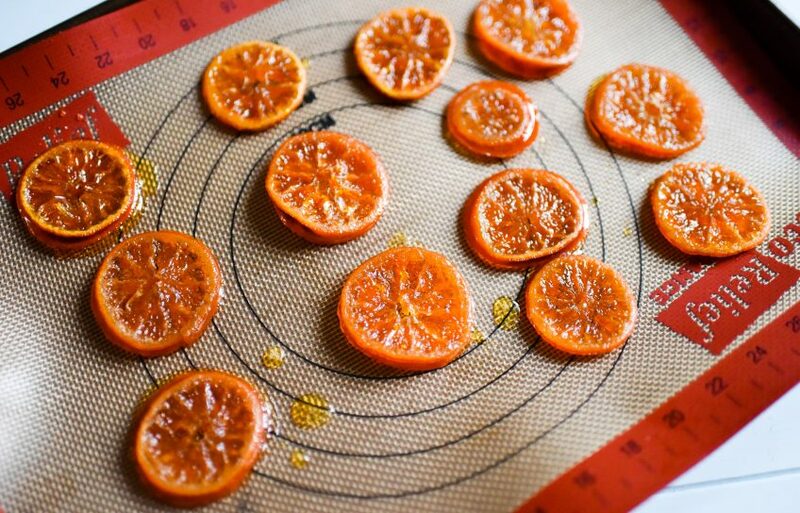 Thank you so much, the clementine slices are delicious and so easy to make. 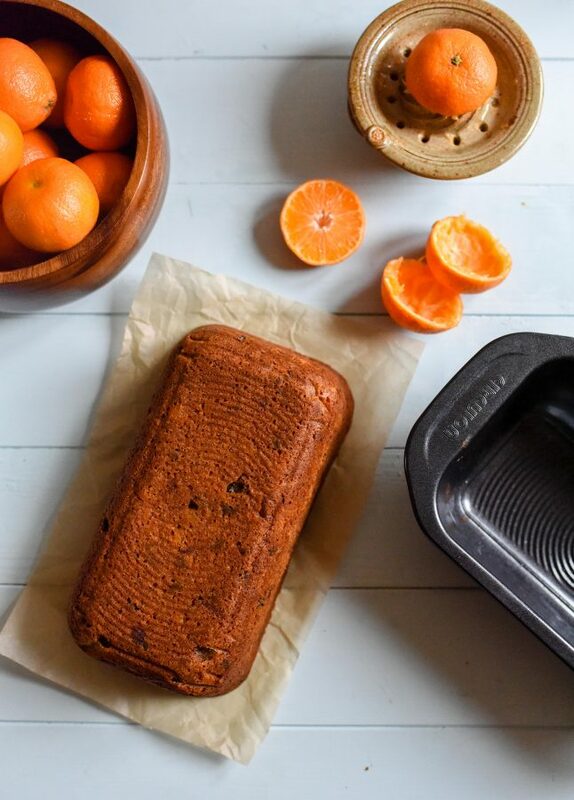 I’m not fond of food waste either – I was going to throw together some mini mincemeat pies, but this mincemeat and clementine cake sounds and looks so much more delicious! Oooh now if only I have enough self control to not eat all those Candied Clementines before I use them on the cake.